Experience three-way connectivity—road, rail and river. There’s also a 4-way connectivity on the cards with access to the proposed Dakshineshwar metro. What’s more, while the rest of the world will commute on wheels, the residents of new Kolkata will have their very own private jetty, ready to ferry them to their preferred destinations. The ferries will ply tirelessly from New Kolkata and Serampore to Babughat and Dakshineshwar. Government College of Engineering & Textile School 1.8 kms. Mahesh Sri Ramkrishna Ashram Vidyalaya 1.43kms. Serampore Big Bazar 600 mtr. City Center II 25.7 kms. New Kolkata Plaza (on site). Serampore ESI Hospital 3.1 Kms. Disha Eye Hospital 5.6 Kms. 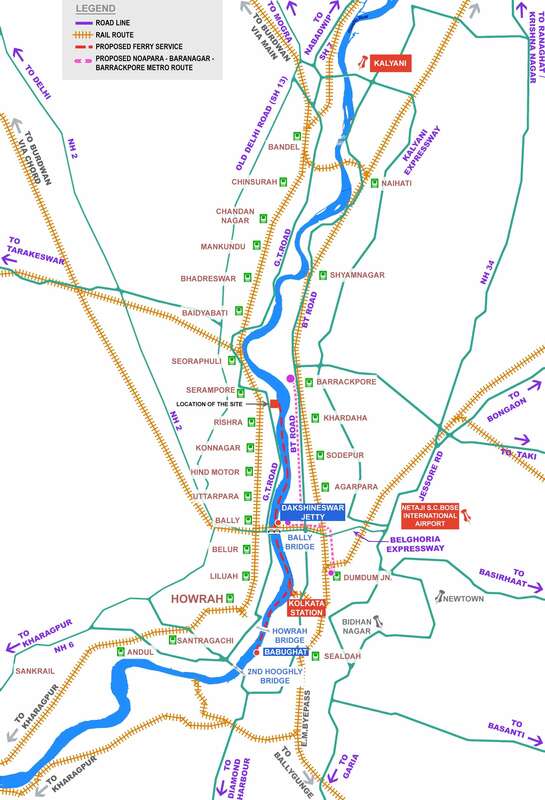 Upcoming Dakshneswar Metro 13.9 kms. Serampore Railway Station 2.5 kms. NSC Bose International Airport 24 kms.